Looking to learn new ways to promote your PMC fundraising while you train for the ride? Join Landry’s Marketing Rides to network with local advertising and marketing professionals during a bike ride with Landry’s marketing director, Jack Johnson. Cyclists will discuss marketing strategies, advertising and promotional ideas with marketing professionals, and learn about Landry’s business and its success in the biking industry. Landry’s Marketing Rides are scheduled once a month from May through October on the Minuteman Bikeway in Arlington Heights. Riders are required to bring their own bikes, gear, and helmets. The ride is about 13 miles and will take about one-and-a-half hours to complete at a casual pace. For more information about the Minuteman Bikeway, visit http://www.minutemanbikeway.org. The next rides are scheduled for Wednesday, May 23 and Thursday, June 14 at 3:45 p.m. on the Minuteman Bikeway in Arlington Heights. Landry’s Marketing Rides are also posted on Landry’s Event Calendar. PMCers interested in joining Landry’s Marketing Rides can email Jack Johnson at jjohnson@landrys.com to RSVP and for more information including future dates and meeting locations. Landry’s is the PMC’s lead bike-shop sponsor. 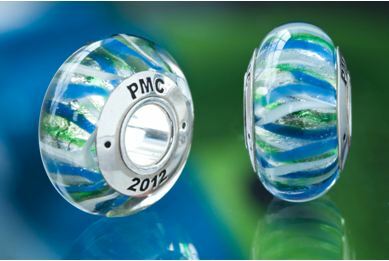 PMC participants can raise money for their ride through the purchase of the new PMC 2012 bead, which generates a 20 percent donation to an individual or team ride. This limited edition bead was designed to match the 2012 rider jerseys. The PMC bead is designed by locally-based company Confidence Beads™. It is inscribed in sterling silver on both sides with PMC 2012, a keepsake to celebrate the accomplishment of any rider, volunteer or supporter. The idea was introduced by Loretta Brightman, whose involvement with the PMC dates back 25 years, when her husband Tim first completed the ride. Tim has ridden every year in honor of his brother, Steve, who died of melanoma at the age of 35. The Brightmans are part of team PHAT Tuesday. “We really are a PMC family, our kids have grown up with the PMC,” said Brightman, adding that their daughter Elyse is a 10-year PMC volunteer, their son Stephen will ride this year in his first PMC, and Tim’s brother Mark will make this his 20th PMC ride. For the Brightman Family, this is a truly inspired, multi-generational lifestyle. Brightman urged her friend Linda Waters, creator of Confidence Beads, to create a PMC bead. “It’s a neat way to show you were involved in the event as a rider, volunteer or supporter,” Brightman said. Waters founded Confidence Beads in 2009. The beads are designed with inspirational messages to empower and inspire women. Each one has a different message and all have an underlying mission to raise both awareness and funds for non-profit partners. From “fearless,” to “fabulous,” to “rock star,” the phrases engraved into Confidence Beads remind wearers of their positive attributes. Waters has partnered with several non-profits on specialty beads and donates a portion of all sales to charity. 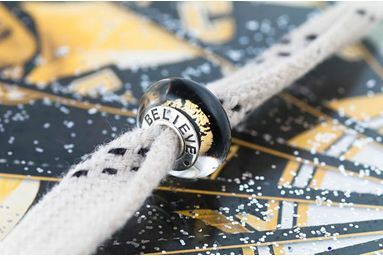 Waters partnered with the Boston Bruins Foundation in 2011 to design a black and goal B’s Believe bead, which has raised more than $9,000 for the B’s Foundation. Waters and her family have participated in the Franklin Kids PMC since its inception and have long supported friends who ride in the PMC. The PMC Bead costs $40 and can be purchased by clicking here. The PMC bead fits on all of today’s popular bracelets and accessories. It can also be purchased with a silver bangle bracelet. Or with a sporty “cable” necklace in royal blue, lime green or white. When purchasing from the website, buyers should be sure to include their PMC Rider ID and/ or Team ID number in the online checkout, ensuring that the donation goes directly to that individual’s fundraising account. PMC Training Ride — in Italy! Looking to combine a vacation with training for the 2012 Pan-Mass Challenge? Join PMC founder Billy Starr and DuVine Adventures in the PMC Piedmont Bike tour – a week of cycling, scenery, and top notch food and wine. Bike your way through Italy and log up to 180 PMC training miles. Between May 28 and June 2, you’ll enjoy breathtaking views, private tasting at vintage wineries, and local hospitality in the ancient towns of Italy’s northwest region. The professionally-led tour includes high-end accommodations, a private cooking class, brand new, handmade Italian carbon bicycles, and options for more challenging rides throughout the trip. PMCers receive a 12 percent discount and all net proceeds from this tour will be donated to the PMC. Click here for tour details and itinerary. DuVine is a PMC sponsor. Read more here. Looking for new cycling equipment? Are you a first time rider ready to purchase your first road bike? Want to meet other PMCers? Landry’s Bicycle, official PMC bike sponsor for the third straight year, is hosting PMC Hospitality events and in-store specials Feb. 9 at all four of its locations: Boston, Natick, Norwood, and Westborough. PMC riders will receive a 10 percent discount all day Feb. 9 on items including bike parts, accessories, clothing and car racks. Landry’s will donate 10 percent of all proceeds of sales on Feb. 9 to the PMC. Mix, mingle, and enjoy refreshments with Landry’s staff and PMCers during a special evening reception from 6 p.m. to 8 p.m. at all four Landry’s locations. Also on Feb. 9, enter a free drawing to win a new-model Cervelo R3 road bike with SRAM Rival components, valued at $3,150. The prize winner will also receive a complimentary Landry’s bike fitting. One ticket per person available at your local Landry’s store and the winner will be announced by March 1. For more information and Landry’s Bike locations, click here. Landry’s Support Team keeps PMCers on the road throughout PMC weekend. 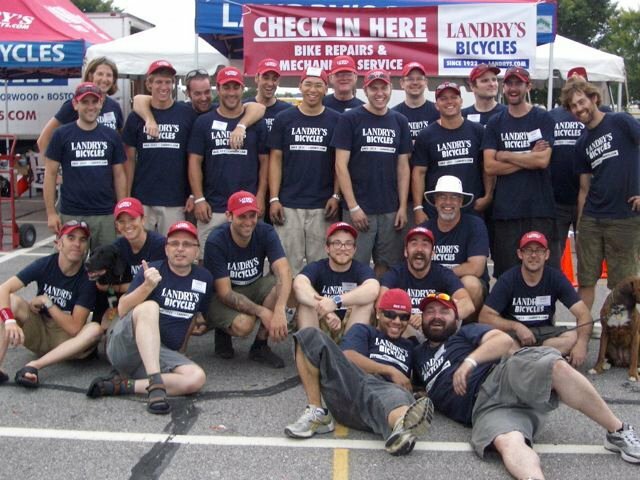 The 33 volunteers from Landry’s provide mechanical support and spare parts at its repair stations in Sturbridge and Bourne. The Landry’s team also supports the PMC all year long hosting events and training rides. Are you dreaming of bike season and warmer weather? Can’t wait for the 2012 Pan-Massachusetts Challenge weekend? DuVine Adventures, a PMC sponsor, is inviting PMCers to hit the road in May for a unique PMC-themed bike trip lead by PMC Founder Billy Starr. Bike tour company DuVine Adventures creates amazing excursions across the globe where world travelers “bike, eat, drink, sleep,” according to their motto. Company founder Andy Levine has been a PMC cyclist for the past three years. In 2012, DuVine became an official PMC sponsor and will donate a portion of all proceeds to the PMC fundraising goal while also raising money through the company’s own PMC team. To get into the PMC spirit this spring, DuVine is hosting the PMC Piedmont Bike Tour a week-long excursion inItaly’s northwest region. PMCers can receive a 12 percent discount and all net proceeds from this tour will be donated to the PMC. Wide open panoramas await you, with breathtaking views of the vineyards and medieval villages off to the distantAlps. Grapes flourish in the rugged soil and we will taste the area’s premier vintages at private tastings and with each meal. Discover the local hospitality in ancient towns, savor Michelin-starred meals and traditional dishes in family homes. You are guaranteed to feel like a native and never want to leave this corner ofItaly. Join the team of 24, train for the PMC and experience DuVine Style on a bike. For more info or to learn more about DuVine Adventures, click here.